Mills River Creamery uses local produce and milk from special Jersey cows to make its silky-smooth ice cream. These aren’t just any cows, though: When Johnston bought this farm in 2016, he hand-selected these dairy cows from the Biltmore herd; each was DNA tested for the A2 protein, which is more digestible for humans than the A1 protein found in most commercially produced milk. Even people who are lactose-intolerant can usually drink it. Johnston’s family has been farming since his grandfather started a commercial dairy farm in 1917. Johnston grew up surrounded by cows and corn. “For people who grow up dairy farming and get an interest in it, it’s pretty hard to get out of your blood,” he says. About four years ago, Johnston opened Mills River Creamery on the family farm. 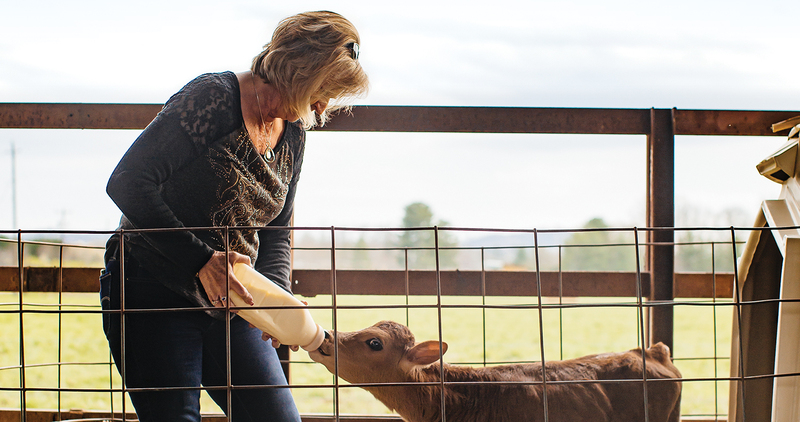 In 2016, he moved the dairy to his new farm, where he continues the tradition with his new herd of Jersey cows and his partner, Nancy Waycaster. At his small storefront on the corner of Highway 280 and Haywood Road, customers pop in for scoops of silky ice cream. The inside of the store is like an old-fashioned soda fountain, with red vinyl stools surrounding retro, high-top tables. Fresh milk, cheese, and eggs fill the refrigerator shelves. The creamery uses as much local produce as possible in its products; strawberries, blueberries, and peaches for the ice cream all come from Mills River farmers.